I've wanted to post about this for a while but I always forgot about taking a picture. I finally remembered today. Every week Kade's homework in the same. Monday - spelling words. Wednesday - story in reader. Thursday - math worksheet. Tuesday's homework is to read books from his browser bag. (He was surprised that I knew what his homework was without looking at the homework sheet. I'm one smart mom. What can I say?) Thankfully he only has to read some of them. He'd be reading for over an hour if he had to read them all. There's more than 40. Each week one or two are added. He read to me tonight while Mickey and the girls were at church. He had some real tongue twisters tonight. "Cluck! Quack! Wham! Whack!" and "Zip! Zap! Quick!" were hard for me to listen to. Who writes these things? 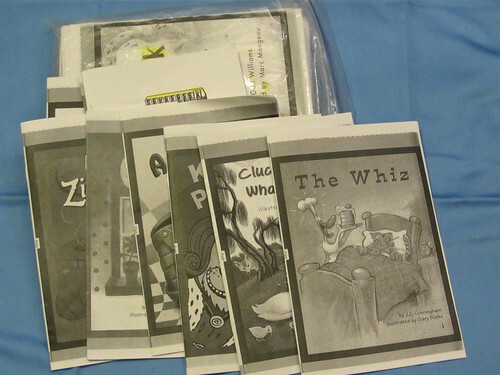 We have "Book in a Bag" to finish tonight, too! I agree--they can be a little inane, especially for the lower reading levels that Eliza's on!